Dicentra (dye-sent-ruh) Bleeding-Heart; Fumitory Family (Fumariaceae). 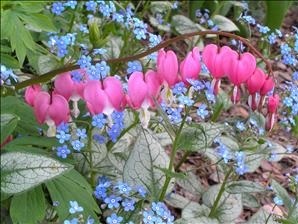 Long-lived perennials, with fern-like, deeply cut leaves, and charming flowers of unusual heart shape in pendant sprays. D.eximia (ex-im-ee-uh), Fringed Bleeding Heart. One of the most tolerant of sun, partial or full shade, and the species having the longest flowering season – from spring to fall. The flowers are rose pink. Attains 1 to 1 ½ foot height. Self-sows readily and easily transplanted. 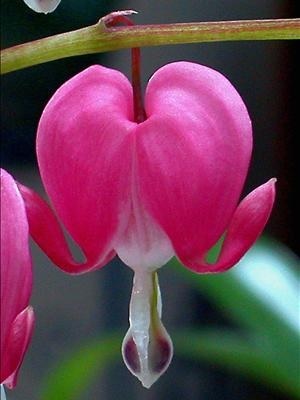 D. spectabilis (spek-tab-il-iss); Common Bleeding Heart. Easily the handsomest species, this is a hardy long-lived perennial from Japan, up to 2 feet tall, with elegantly arching sprays of rose-colored, heart shaped blooms. Blooms from April to June. Dicentra is most at home in part to full shade woodland settings. It likes rich, loose soil that is evenly moist but also well-drained. At planting time, add lots of compost, humus, or peat moss to the soil to enhance its water retention capabilities. Plants will not grow well in heavy clay soils. Dicentra should be planted in locations that are protected from high winds and early frosts, such as the edges of woodlands or on the north or east sides of buildings. Dicentra may be propagated by division in either spring or fall, taking great care to keep the fleshy roots intact when transplanting. If spent flowers are not removed, small pods develop and drop their seeds when mature and dry. If these seeds are left undisturbed, they will germinate the following spring. The resulting plantlets are easy to transplant while they are still small. Use as border plants, in containers, for cut flowers, for edging, and in mass plantings. Racemes make delightful additions to fresh bouquets, lasting about 2 weeks in a vase. Attracts hummingbirds. Deer resistant. PLANTING: Set plants 12 to 24 inches apart, depending on species. Choose a shady or partly shaded location, where the soil is rich, humusy and well-drained. D. x ' Luxuriant' can be grown in full sun. MAINTENANCE: Plants should be watered during periods of drought. We recommend a summer mulch to help conserve moisture, as well as a protective mulch in winter. D. spectabilis tends to go dormant in midsummer. It is unlikely that division will become necessary, but if it does, divide in spring. Zones 3-9. Dicentra 2 to 5 eye bare root divisions would typically fit into a 1 to 2-gallon container.